Although widely recognized as founder and key figure in the current re-emergence of pragmatism, Charles Peirce is rarely brought into contemporary dialogue. In this book, Kory Sorrell shows that Peirce has much to offer contemporary debate and deepens the value of Peirce's view of representation in light of feminist epistemology, philosophy of science, and cultural anthropology. Drawing also on William James and John Dewey, Sorrell identifies ways in which bias, authority, and purpose are ineluctable constituents of shared representation. 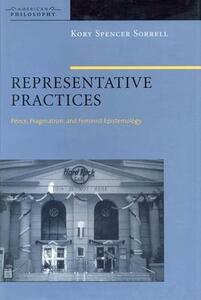 He nevertheless defends Peirce's realistic account of representation, showing how the independently real world both constrains social representation and informs its content. Most importantly, Sorrell shows how members of a given community not only represent but transform a shared world-and how those practices of representation may, and should, be improved.